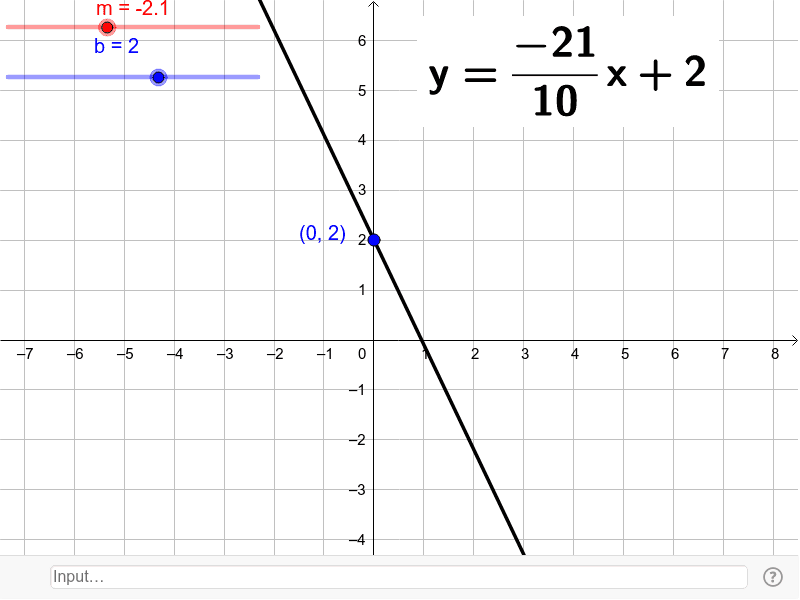 Adjust the slope (m) using the slider so that it is equal to 2. Adjust the intercept (b) using the slider so that it is equal to 3. Look at the equation. What do you notice? Adjust the slope (m) using the slider so that it is equal to -3. Adjust the intercept (b) using the slider so that it is equal to -4. Look at the equation. What do you notice? Adjust the slope (m) using the slider so that it is equal to 1/2. Adjust the intercept (b) using the slider so that it is equal to -2. Look at the equation. What do you notice? Based on what you have observed, how do you write an equation in slope-intercept form?